Update 11 OCT 2018: Wow, has it already been 11 years? So check this out. 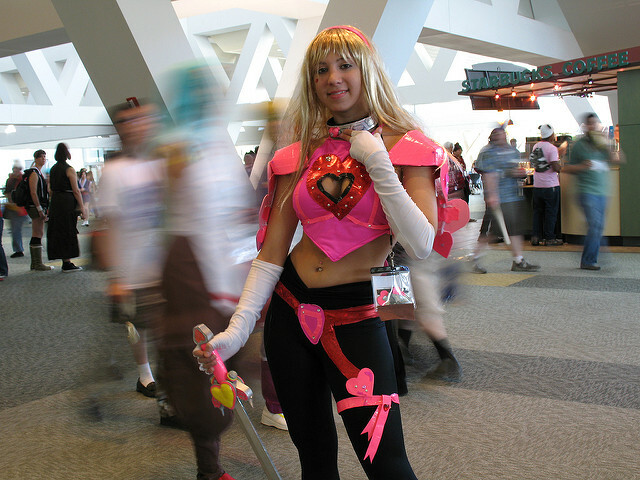 Originally when I posted these Otakon shots they were split into multiple blog posts. I guess it made sense in the past because it gave people a reason to return to my bog. But nowadays I don’t think I’d milk it like that. So now I’ve contained everything in this one blog post. Nothing’s been lost. If you go on Flickr you’ll see all my little anecdotes and stories are still there. I created a new Otakon 2007 collection on Flickr to make things simpler. Hope it helps. So, Otakon happened. It was my first time at an anime convention. Not at all what I was expecting. It was better! Cosplayers as far as the eye could see. My goal was to go there and take as many photos as possible. And I wanted to do a better job than I did at New York Comicon A.K.A. NYCC. I liked this costume. My cousin later pointed out in the photo that he got a little blue on it. Ha! My biggest regret on reviewing the photos I shot for NYCC was how blurry they were. I attribute this to my not so nerves of steel. I'm always on edge! To remedy this I got a monopod. Constantly holding a camera in mid-air will get tiring. Especially my camera which has a significant heft to it. 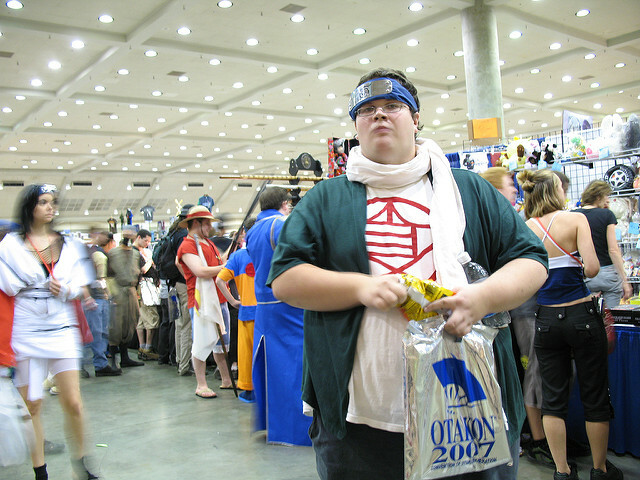 This Choji cosplayer cracked me up! Full story on Flickr. The monopod, while being a big help, did sometimes fail me. The telescoping mechanism collapsed a few times. I'm thinking of either getting a better model or looking into portable tripods. The problem with tripods is that when it comes time to shoot a photo I have to set it up every time. I would need to extend THREE legs as opposed to just one. I can't walk around with it extended or I’m a danger to the people around me. 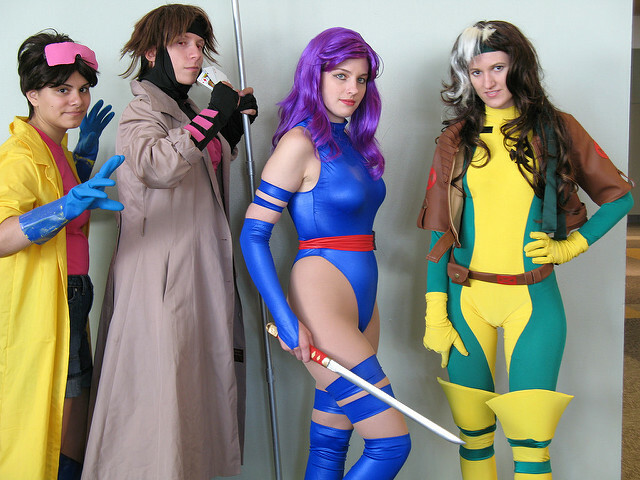 These four X-Men cosplayers look really great together! And it was awkward extending the monopod every time I needed to snap a photo. Though not a single person grew impatient with me. In fact I was probably harder on myself than anybody! I made a joke of it and pretended I was the Monkey King by going POWER POLE EXTEND! The only good thing to come from the live-action Cutey Honey film was the cosplay. The other thing I needed to do was preview my shots better than I did at NYCC. Last time when I transferred my photos to PC I was SHOCKED by how blurry my shots came out. The problem is when you preview your photos on such a small display they look alright. You need to employ the zoom feature and inspect the shots to really be sure. I didn't do this after every shot but I did do it a lot more than last time. This helped because a few times I caught myself and took additional shots. Speaking of taking additional shots, I've started bracketing. The way my camera works I can set a timer to take shots for me without pressing the shutter. By doing this I'm able to concentrate more on holding the camera steady. Or in my case, the monopod. When I manually press the shutter the camera moves. I'll have to work on that. Maybe I can join the armed forces and train to be a sniper. I'll go through five years of that for the sole purpose of taking sharper photos. Good idea? I guess this is Ralf? Maybe Clark? Nobody knows the difference. So that's the technical side of things. My other goal was to learn a little more about the people behind the cosplays. Just a little. (A tiny bit!) Along with taking their photos I asked for their name, age, location and e-mail. You'll find that information (minus their e-mail, duh), in the flickr gallery. I also tried to write a little story about taking each photo. I’m all about that added value! I've always posted my photos with captions and added a personal touch. I think you'll like the way I've done it this time. I showed it to someone else (before making it live) and they said they really liked it and it made the gallery a lot more interesting. These people work so hard on their costumes, you know? The least I can do is get them a little recognition. I want you to know who they are. I want you so see how far they’ve traveled. My friend Sierra cosplaying as Rangiku Matsumoto from Bleach. What I've also done is link to their MySpace profiles. This way you can learn more about them and if they have something to promote it helps them out a bit. They need to have one. Duh. Must not be a private profile. Otherwise I didn't link to it. Of course, if you're reading this now and want me to link to it anyway then I'll be happy to accommodate your wishes. My cousin likes playing as Voldo. He spotted this guy from the floor above.